I expected Mercure Hotel Hamburg City to be a cookie-cutter hotel. You know the sort: identical furniture to every other hotel in its class, usually in shades of brown and red. As a four-star, I expected the furniture to be the standard: a bed with plain headboard, two end tables, reading lamps, a desk, a chair and that’s it. The sheets would be quality cotton and I’d have a choice of pillows. And another disclosure: This is a sponsored post. Mercure Hotel Hamburg City hosted my husband and me for free in exchange for writing this review. Nevertheless, all opinions expressed here are my own. This expectation made me a little hesitant about accepting a sponsorship with this hotel. I mean, what was I going to write about a bog-standard hotel room? The sponsorship was part of the #cometohamburg promotion in which bloggers and other journalists receive accommodations and admissions to Hamburg sights in exchange for writing reviews and/or social media mentions. I was given a choice of three hotels and, to be honest, I chose Mercure Hotel Hamburg City because it was the only one with parking on site. So I breathed a sigh of relief as soon as I saw our room. 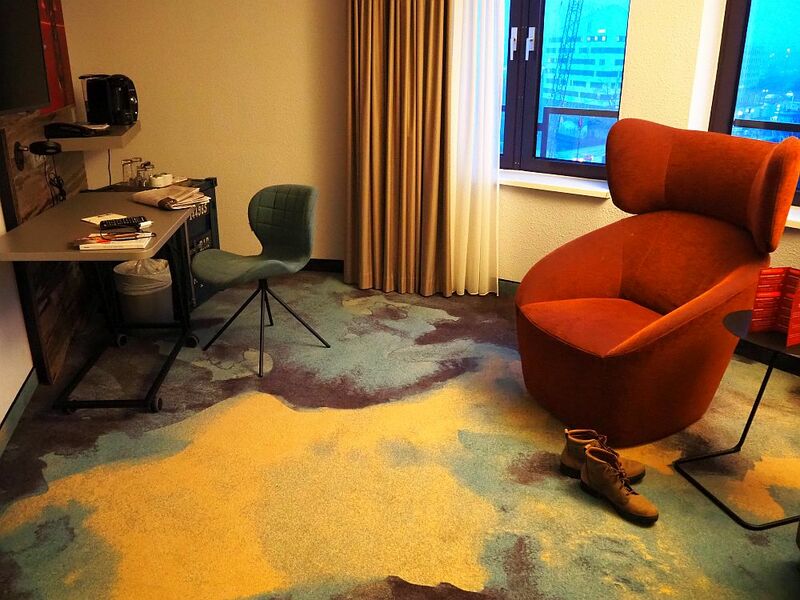 Despite being part of a large chain, Mercure Hotel Hamburg City is far from standard, at least in its décor. Being in Hamburg, a city whose economy is based on trade through its large harbor, the hotel’s décor echoes the harbor theme. It’s remarkably well-done. Entering our “junior suite,” the first sign of the theme was the closet in the entrance hallway. The doors are blue-painted metal, complete with stenciled letters and a large, metal handle just like on a shipping container. The carpet is patterned to look like water. 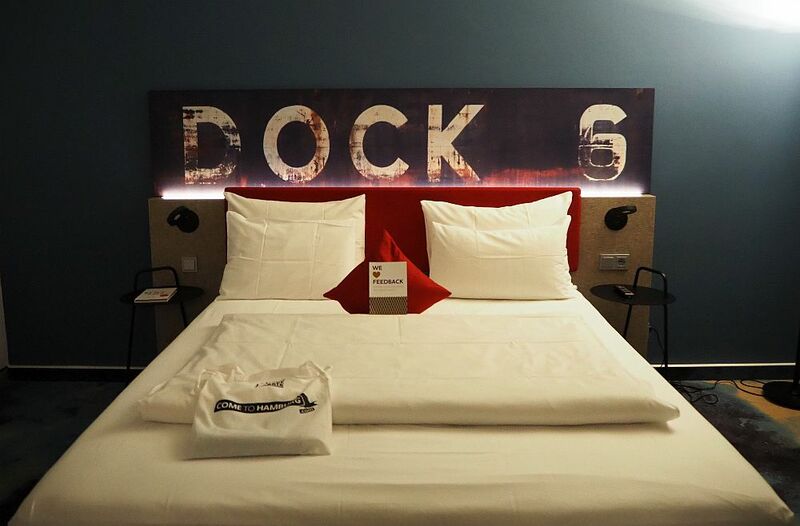 Above the bed, a long metal sign, lit from below, proclaims “DOCK 6” in block letters. 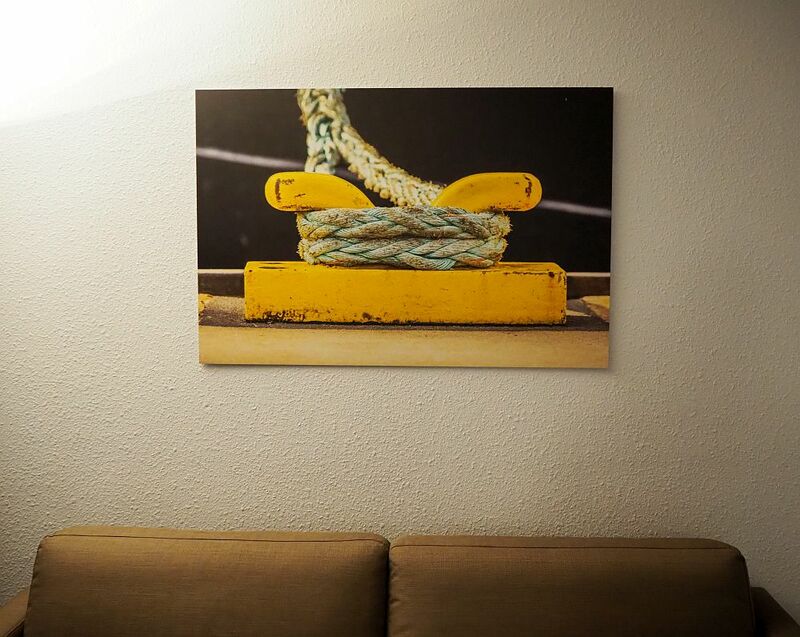 On the walls are photos that zoom in on harbor-related details: an anchor chain as it hangs from a cargo ship, a large rope wrapped around a cleat on the pier. Even the mini-fridge door is painted like a container. It amused us and, somehow, it worked. Besides the clever theme, the room was satisfactory in every way you’d expect a four-star room to be. The bed was comfortable, as were the pillows. The sheets were high quality. Both sides of the bed had reading lights, both of which worked (You’d be surprised how often they don’t!). The chairs were chic and comfortable at the same time. Once we figured out the coffee/tea machine (it was the kind with pods, but not a model we were familiar with), we enjoyed good quality tea. One end of the living room: the armchair was so comfortable that my husband promptly fell asleep in it after our long drive to Hamburg. The bathroom was small, so there was no tub, but the shower had a choice of regular showerhead on the wall or a rainshower set into the ceiling. I’ve stayed in a lot of four-star hotels and was very impressed by how quickly the water turned hot and, especially, how precisely I could set that temperature and not have it keep changing of its own accord. Our room was on the fifth floor and faced the street, where construction of some sort was going on. Yet we heard no street noise at all. The view wasn’t particularly interesting or beautiful. I suspect it’s better on the back side of the building, which stands on a canal. I never saw the view from that side, so I can’t be sure. Artworks, like this one above the sofa in our suite, are photos printed onto metal, I think. Because it was a junior suite, there were two large-screen TVs: one in the bedroom section and one in the living room section. This turned out to be a bit awkward, though, since the two TVs backed on each other. I suppose the idea is that you only use one of them at a time, watching either from the living room or the bedroom. However, my husband wanted to watch sports and I didn’t, so we each took a TV and a remote and started surfing. It didn’t work; both of the remotes worked both of the TVs, so if either of us switched channels, so did the other. Other than that rather minor detail, we were entirely satisfied with the room. As for the staff, they were unfailingly polite and helpful. One night we ate at the hotel’s restaurant, which is darkly lit and atmospheric. My fish was good but not great. My husband, though, was impressed by his perfectly prepared steak. Mercure Hotel Hamburg City is a four-star hotel, so it doesn’t have the extras of many five-star hotels: no pool or concierge, for example, and I wasn’t greeted by name as I entered. It does have a sauna in the basement, however. And I was as comfortable as I’ve ever been in a five-star hotel, with a remarkably well-designed room that I didn’t mind spending time in. In other words, the Mercure Hotel Hamburg City is a good-value four-star that doesn’t look like a carbon copy of every other four-star hotel chain out there. Now I’m curious to stay in another Mercure Hotel somewhere else, to see if they are all so uniquely designed. 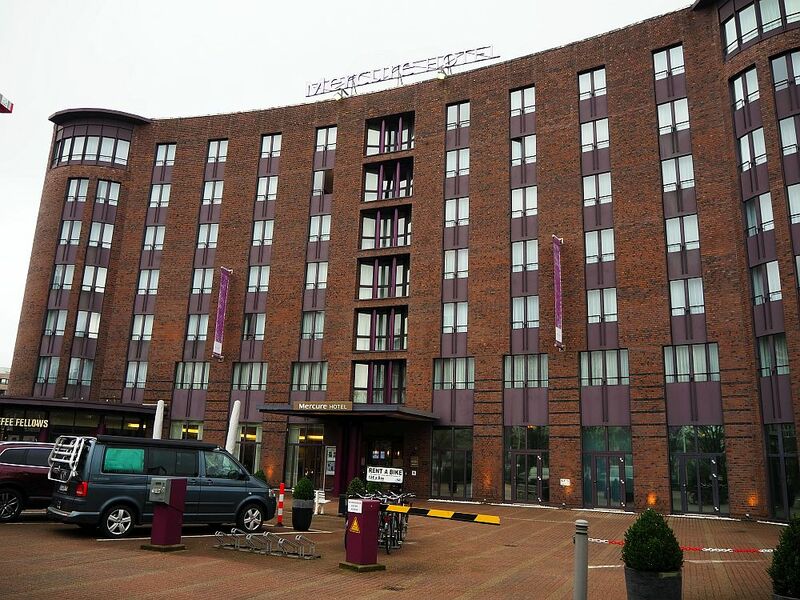 While Mercure Hotel Hamburg City isn’t in the historical center of Hamburg, it’s not far away: about 8 minutes by bus. We spent a Friday to Sunday there and never waited more than a few minutes for one of the two buses that could take us to the center. Hamburg is a bit more complicated than that, though. There are interesting places to see that are not in the center of town, so you’ll end up taking buses or subways quite a bit. As part of the #cometohamburg campaign, we also received a Hamburg City Card, which allowed us unlimited public transportation and also includes discounts to many of the sights. It’s worth getting if you’re planning to try to see a lot in a short time, as we were. 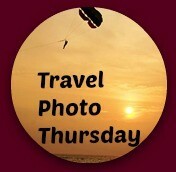 To book this hotel, just click on this link. I’ll be posting another article soon about the things I saw in Hamburg; it continues the harbor city theme! In the meantime, please share this article on social media!